This is another one of my weird throw-a-bunch-of-stuff-together-because-I-don't-feel-like-going-to-the-store recipes. We had some leftover taco meat but no more tortillas, and spaghetti but no spaghetti sauce, so it was time to get creative! Thankfully, this was one of those creative recipes that turned out. My husband ate one bite and said, "You have to put this on the blog!" Win. He's even requested that it be added to our rotation of dinners. Double win. You'll notice I give the amounts for this recipe more in ranges than specific amounts. It's very forgiving, and can be adjusted according to your own tastes. To tell the truth, I don't exactly measure it, I just guesstimate and throw it all together. Brown the ground beef with the taco seasoning. While meat is browning, cook spaghetti noodles according to package directions. Preheat the oven to 350°. Drain pasta and return to pot. Add taco meat, sour cream, salsa, and 1 C of shredded cheddar. Use a pasta server to mix well. It will look all gooey and delightful. 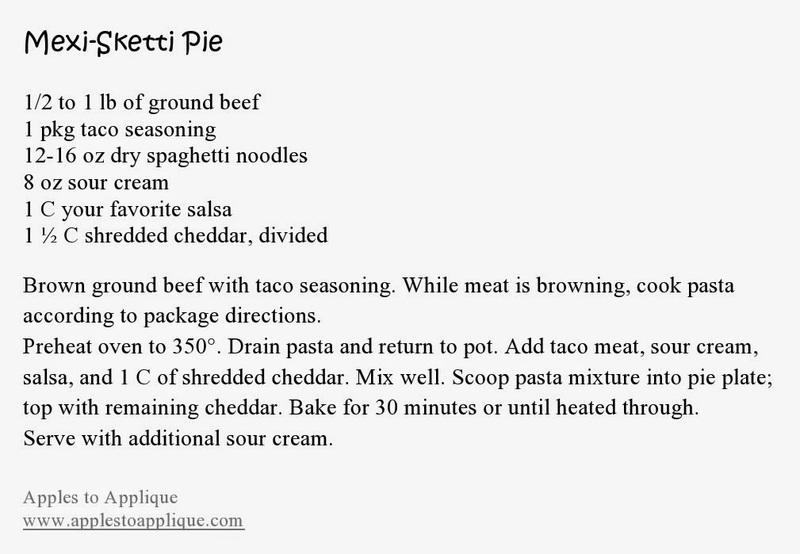 Scoop pasta mixture into a pie plate. You can smash it down a little if you need to in order to make it all fit. Mmm, melty cheese is always so yummy-looking! Cut into slices and serve with additional sour cream. I hope your family likes this recipe as much as mine does. If you give it a try, I would love to hear what you think! You could toss some spinach in there also... maybe... or not.. I might just be really hungry right now.. Some spinach would definitely "healthy it up" a bit more. I know when I'm really hungry I will eat some strange combinations, and a lot of them turn out good! You had me at sour cream! Oh, Patti, I know! I will eat sour cream with anything! Haha, I know! I need to stay off of Pinterest and food blogs when I'm hungry! I think my boyfriend would like this one. Maybe even the kids :) The name is really cute. That looks great!!! My kids and hubby will love it! Thank you! I hope they enjoy it! Oh YUM!! This looks so good!! I can't wait to try it!! Yes, it is a great way to use up leftover noodles or taco meat! This looks yummy. It would be great after a long day at work! This looks good and different and possibly something my picky 4 year old might eat. We're all on a more healthy diet so would you have any ideas on what to add to it to make it so? I would use whole-wheat pasta and low-fat sour cream to begin with. Then you could add some vegetables; another reader suggested spinach, and I personally like the flavor of sweet potatoes with Mexican dishes. I would also add some black beans. If you try some variations on the recipe I would love to hear about it!